We have about 90 animals: three working bulls, about 40 breeding females with their calves, and growing heifers and steers. The heifers are added to the breeding herd or sold, and the steers eventually become beef. 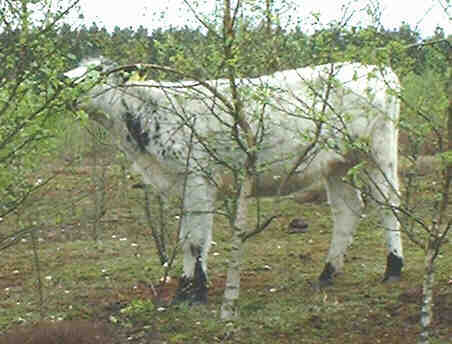 Most of the year the cattle live entirely on natural forage. In the winter the more demanding animals (such as in-milk mothers) are fed hay and straw in our yard, while the rest live on dry heathland, where they eat heather and only need a little extra feed. We keep chemical inputs to a minimum. No fertilisers or herbicides are used on the land, and treatment of the animals is limited to medicines if they are ever ill (rarely) and occasional parasite treatments (using methods which avoid harm to dung insects and other wild invertebrates). Stocking density is low, each animal using between about 1 and as much as 10 hectares (2½ to 25 acres), depending upon the habitat and the time of year. Calves remain with their mothers, weaning naturally at about nine months old. We do not normally milk the cows, though sometimes we will hand-milk a little, for example to help prevent mastitis when weaning, or when a cow has lost a calf. The milk is very creamy, and when we make butter it varies in texture according to the pasture. Their cheese is superb! The cattle are keen and adventurous foragers. As well as grass and heather, they eat nettles, rushes, thistles and many other plants, sometimes preferring them to lush grass. They eat most broadleaved trees and shrubs (if they can reach them) often helping with scrub clearance. They are cautious with new plants, sniffing and nibbling for several days before eating them properly--this is important for grazing animals so they don't get poisoned. There are some plants (such as ragwort and rhododendron) which they never eat, however hungry. Page created with Wordperfect 8 and Notepad. Last updated: 12 September 2007. Please send comments to: comment@collingridge.net.